After years of unresolved lock lust, in 2004 I scrape together enough money for training dreads (ie: synthetic dreaded hair extensions that are glued and sewn to my natural hair). 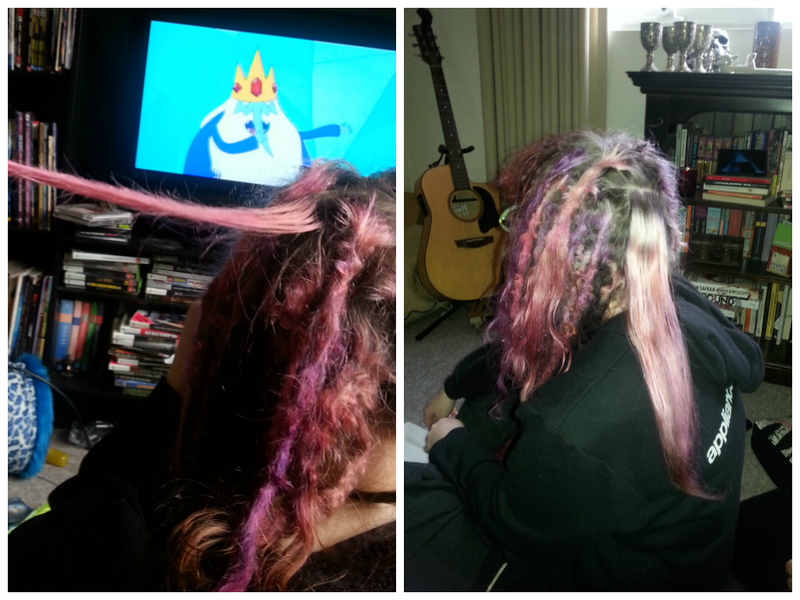 As my own hair grows, I twist and stitch the roots to mould them into separate dreads. And by *I* I mean whoever I can ply with kind words and/or booze. My mum and best friend do a lot of hair sewing, the latter of whom quite enjoys picking around to see how much foil confetti she can find embedded in the knots. My advice for dread heads: avoid NYE glitter flights. 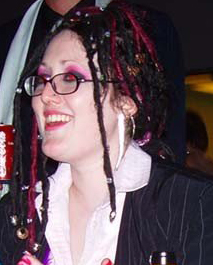 Alas, there aren’t a lot of photos of my training dreads. I was a tech-and-cash-challenged student who didn’t have a digital camera (or even a half-decent phone), so the above pic is all you get. 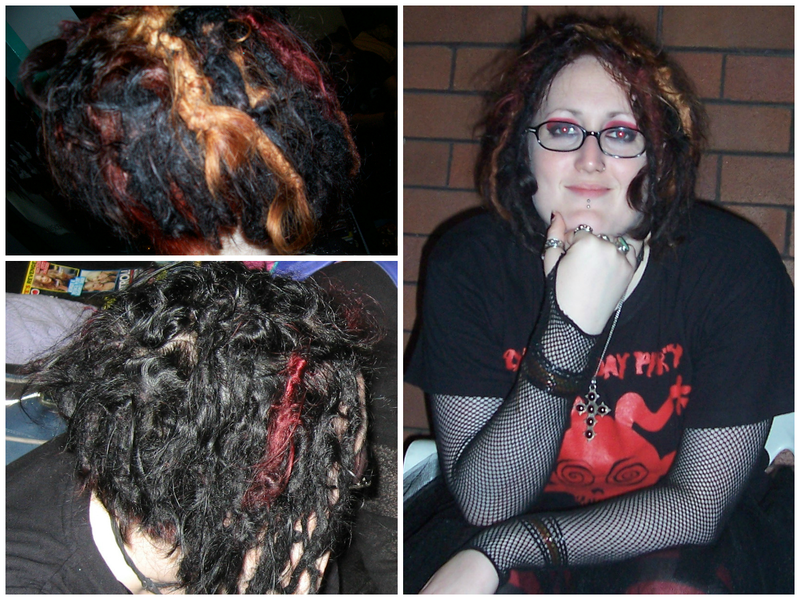 I get sick of long hair after about a year, so my glitter-obsessed friend and I remove the extensions in 2005. We do it by cutting into the tops of the extensions, then pulling my own hair out. After a few months of short, messy baby dreads, I admit partial defeat. The hair at the base of my head isn’t cooperating, so I solve the problem by getting an undercut. As for hair colours, they’re mostly fairly natural-looking (reds, blacks, coppers, etc). The few hairdressers I visit are unfamiliar with dreads and don’t know how to work with them. 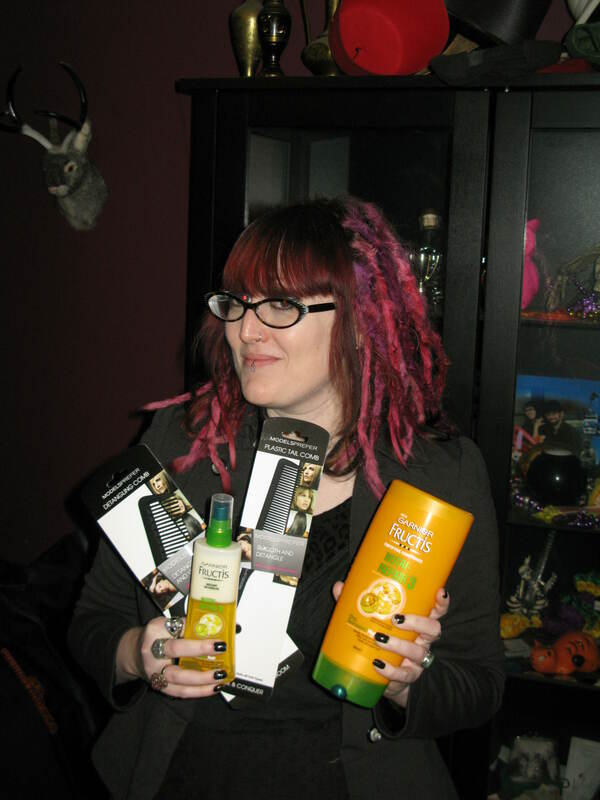 With the exception of reshaving the undercut, I decide to keep all of my hair maintenance in-house. This is a wise decision. 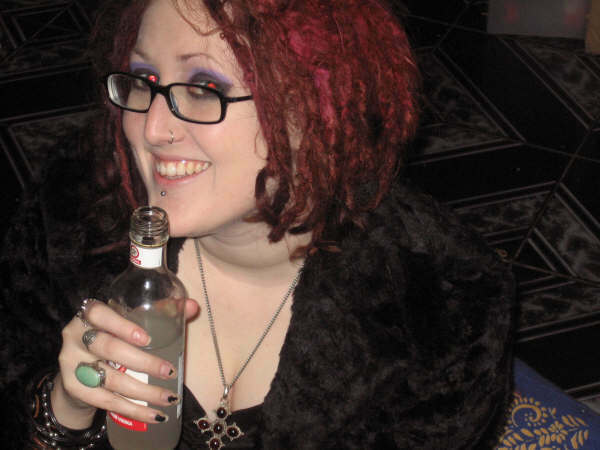 My dreads gradually tighten up, and I test the limits of my bleaching (and drinking) abilities. 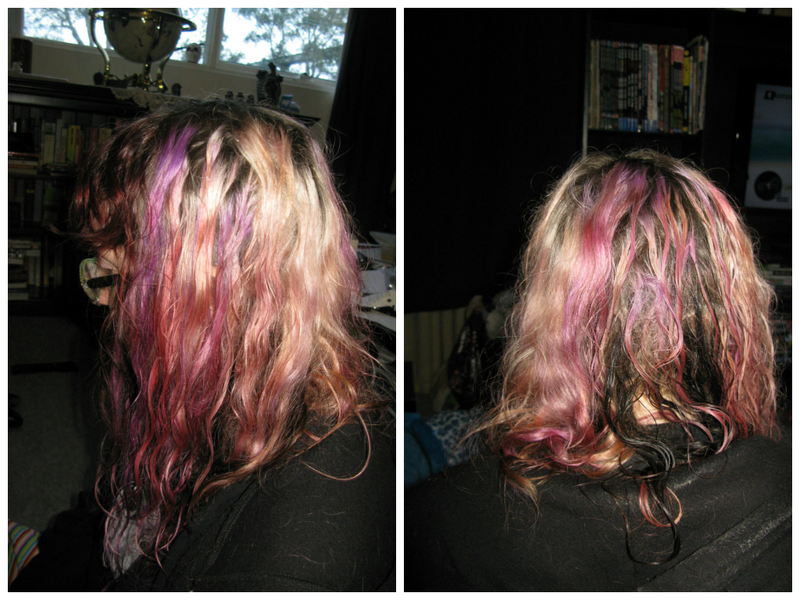 Working and living in London, I discover Camden and fall in love with Directions hair dye. Dreads are sponges, and drastically changing their colour requires long-term planning, patience, and basic knowledge of the colour wheel. Unfortunately I am deficient in all of these areas, so my partner and I just attack my head with chemicals and watch the results. The winds of change are in the… wind? 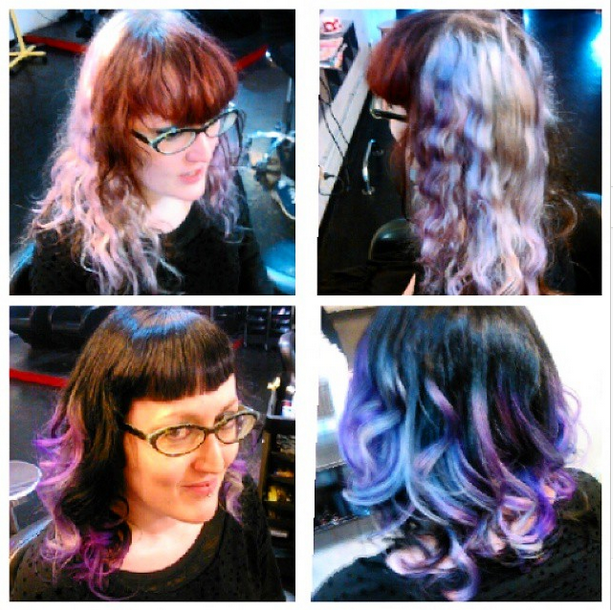 I find some talented hair artists, and together we create a fringe and some awesome scalp designs. Etchings are like crop circles for hair, so I guess I do have some justification for posting this in Total Batshit after all. For the most part my partner and I continue to look after the dyeing part of the dread routine. I am forced to provide many beer bribes. 2012: The cracks begin to show? 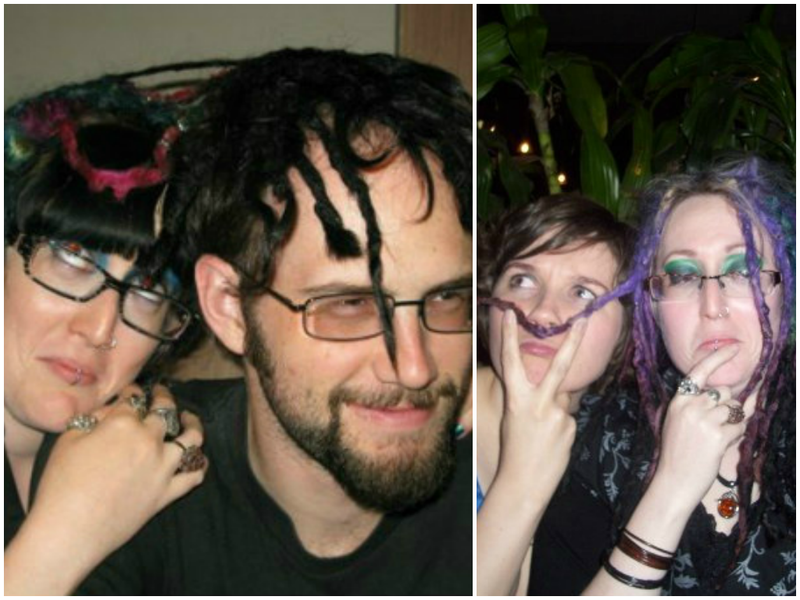 During 2012 I spend a month in Asia, and the humidity wreaks havoc on my dreads. My hair loosens up and loses some of its bulk; I respond by growing out my undercut so I can create more dreads. This is a long and unattractive process (think dreads with a mullet underneath! 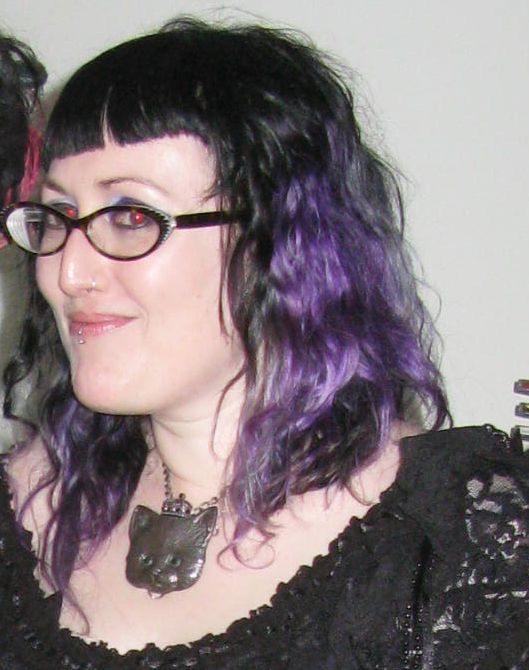 ), so it’s not surprising that I begin thinking about changing my hair. However, I change my mind when a hairdresser (NOT one of my regulars) tells me my dreads are awful and need to be shaved off. 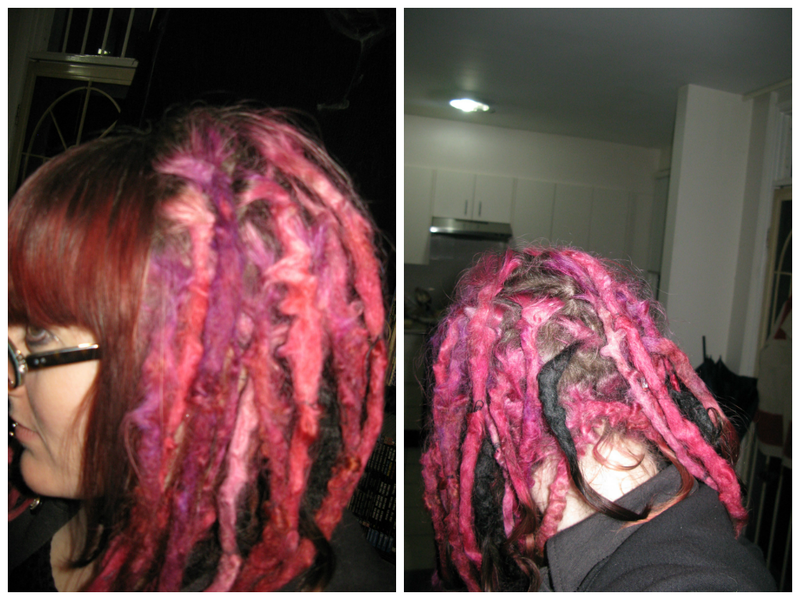 Out of spite, I pay someone else to restore my dreads to their former glory. We tighten the locks, replace the undercut mullet with extensi0ns, and I go on to enjoy another 18 months of hair compliments. 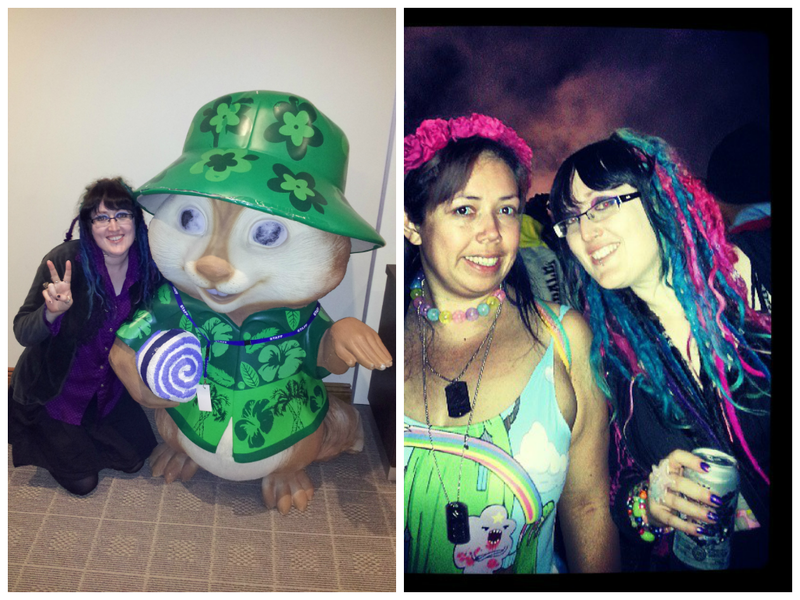 I celebrate by hobnobbing with A-list celebrities (yes, that is Theodore – as in Alvin, Simon, Theodore – that I’m casually posing with) and disgracing myself at music festivals. So that just about brings us to the present day. Want to know how I (and two very patient helpers) combed out 10 years of matted knots? Read on. August 2014, the night before The Great Combing. What do I do with this stuff? From online research and my own experience of creating a fringe, I know it’s possible to comb out dreads and that the newly released hair is often surprisingly healthy and soft. However, I still anticipate a fair amount of breakage, which would not be a great look (especially with my fine hair). In the weeks leading up to The Great Combing, I trawl Pinterest for short ‘dos and stock up on conditioner, detangler, and combs. I also stop my everyday dread maintenance (which mostly just consisted of twisting my dreads at the roots to encourage them into happy little hair sausages) and start shampooing more than usual to loosen up the hair near my scalp. This effort, combined with the fact that I’m overdue for a proper tightening, helps make my dreads look loose and messy. Please note the emphasis on “look”. On the morning of The Great Combing, I wash and – for the first time in over 10 years – condition my hair. I massage the conditioner into the dreads and used my fingers to loosen up the hair near my scalp. Then, with my hair still wet, my best friend (yes, the one with the glitter fixation) and I begin combing. Using fine-tooth combs, we start at the bottom of each individual dread and work our way up. We use the detangler whenever my hair starts to dry, but it’s nowhere near enough to break down the knots; after two hours we’ve only managed to comb out a couple of dreads. We only make real progress when my hair is wet, so every 1.5 – 2 hours I take another shower to recondition and squish my hair apart with my fingers. These showers are not pleasant – my old hair comes out in clumps, which slop down my body and clog our drain. But with each one my dreads become looser and our job easier. The next 13 hours pass in a tedious haze of combing and showers. We don’t even find anything interesting, which is disappointing considering all the things I’d put in my dreads over the years. Not even any of that troublesome foil confetti! And forget all those urban legends about baby spiders! We find no evidence of any creatures living or deceased, despite the many that had attempted to build nests in the past. What we do find is lint (makes sense: my hair was kind of velcro-y) and hairspray. Some of the lint has hardened (I assume from washing, dyeing, etc), which makes it difficult to comb out, but the hairspray is the real nightmare. It had been used as part of the maintenance/extension process 18 months earlier, and while it was great for binding loose, random scalp hairs I would NOT recommend it to anyone who wants to keep their hair post-dread. Stick with backcombing, palm rolling, and a crochet hook. Needless to say, I am not in love with my new look. As I lay in bed I wonder if I can use personal leave for an emergency hair appointment on Monday. Thankfully, the next day turns out to be much smoother sailing (combing), which is a double relief because my neck and shoulders are killing me. I wash and condition again in the morning, then my partner and I spend the next eight hours over the bathroom sink. We massage conditioner into each individual dread as we comb, and by the end of the day we’ve removed all but six. Fearing tangles, I put my strange new hair into loose plaits before bed. To my absolute surprise, the daytime result isn’t that bad. Over the next few days I continue to comb out the remaining dreads and knotty patches during my evening showers, and my hair’s condition and style rapidly improves. After a combined total of 23 hours’ work, I finally finish on Wednesday night. Despite everything I’d read about successful comb-outs, I’d really believed that hair as fine as mine would end up with a lot of noticeable breakage. I’m kind of stunned by how much healthy hair I have! I visit my favourite hairstylist a few days later, who’s also a tad shocked by my success. We both have so much new-found respect for my hair’s tenacity that we decide to keep most of it, which is how I end up with my first “pretty” haircut. I haven’t had natural hair this long since I was 12! It’s been a few weeks now, but I’m still playing with styles and trying to adjust to having hair that moves in the breeze. It’s a fun change, and one that’s definitely doable if you have time, patience, and a burning desire to keep your hair. Like weird conspiracies and far-out tales? Read more Total Batshit! Started combing out my eight year old dreads a few weeks ago and those scissors are looking like a really good idea! Thanks for writing this, it’s renewed my perseverance!! From a half frizzy head/half dread head!